Anyone a Skype addict or a TeamSpeak/Ventrilo/RaidCall vet? I need a new headset and I'm not sure where to look or what to get. The problem with me is that I travel a lot with my headsets, especially at school. Because I have limited space for proper storage such as its own bag, I often destroy headsets very quickly. I feel like there has to be a headset that's designed to be traveled with all the time (retractable cords or folding headset maybe? ), but I'm having a lot of trouble actually finding it. Anyone have any suggestions for headsets? I'm not looking for anything spectacular (or more than 50-60 bucks honestly), just something that I can count on to work for an extended period of time and is more designed with durability in mind. 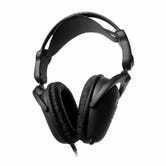 I'm really tempted by this cheap SteelSeries headset. Seems like it might meet my needs and heard good things about SteelSeries.